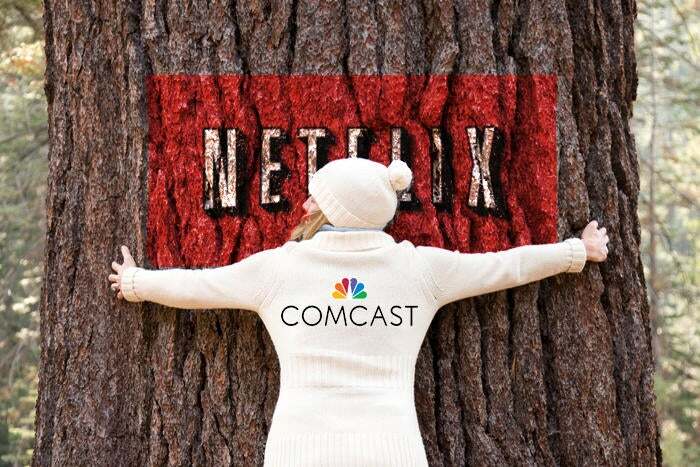 Why does Comcast suddenly love Netflix? AT&T is giving away Apple TVs and Comcast is giving its customers access to Netflix. Is the war between cable and streaming video services about to end? If you can’t beat ‘em, join ‘em, goes the old saying. And it appears that pay TV providers, under pressure from streaming video companies like Netflix, have decide to find common ground with their rivals – and that’s turning into a win for consumers. Comcast, which added Netflix to its X1 pay TV service in November, just announced that subscribers can access the popular streaming service for free during its April “Watchathon.” And AT&T is giving away an Apple TV to consumers who subscribe to the more expensive tiers of its DirecTV Now service. Not long ago, these promotions and alliances would have been “unthinkable,” as one industry publication put it. But that view is changing. “Now we see Netflix as a complementary network,” a Comcast official told me. Comcast has made it simple for its X1 subscribers, who make up about half of its pay TV customer base, to view Netflix. The streaming service is one of a number of apps customers can access on their televisions without having to use a separate device like a Roku box, or own a smart TV. There’s no price break for subscribing to both, but the charge for Netflix will appear on the customer’s Comcast bill. There is one catch: Netflix, of course, is delivered over the internet, and Comcast customers who wants to subscribe to it must also be Comcast broadband subscribers. The Watchathon, which runs from April 3 to April 9 is a chance for Comcast customers to get a free sample of premium networks, including Starz and Showtime, along with basic cable channels they might not already subscribe to. AT&T’s offer is a bit complicated, but in essence, subscribers to some tiers of AT&T-owned DirecTV Now can get HBO for a whole year for free. To qualify, you need to subscribe to either the 100-channel Go Big package for $60 a month or the 120-channel Gotta Have It $70 a month plan. AT&T is also offering a free 32 GB version of the Apple TV to anyone who prepays for three months of DirecTV Now service. Apple TV is a device that allows users to watch streaming video over the Internet on a television. Both AT&T offers expire at the end of the month. Cable companies and streaming services aren’t exactly singing Kumbaya; it’s still a deadly serious rivalry. Despite some overheated reporting, cable companies are not being driven out of business by their digital rivals. But streaming is clearly the wave of the future, so giving cable customers some limited streaming options makes perfect sense, both as a perk and a way for old-school companies to get some experience with a new business model. There's is, though, a risk that those customers could like streaming so much they'll cut the cord and defect. From the point of view of Netflix, partnering with Comcast is very smart because it will expose their services to millions of TV watchers who never thought to tune into a streaming video service. And most important of all, consumers come out on top.